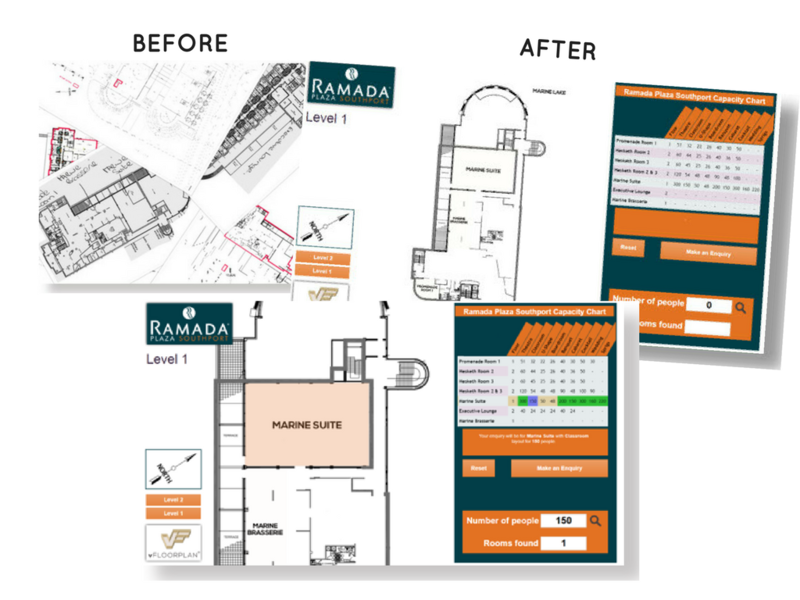 We enhance an existing static floorplan to become an engaging, interactive and easy to understand, enquiry generating solution on their website. With instant x-ray search, with room layout/set-up filters, floorplan highlighting to a linked capacity chart, website visitors can interact with floorplans like never before. They can make enquiries to their sales team and it can be used to guide prospects on the phone or in person on a tablet, to find the best fit for their needs. Annual Subscription includes hosting of the live vFloorplan 2D, including enquiry generation, minor chart alterations, software licence with minor software updates. Customers get to see the venues like never before, bringing them to life and providing a greater insight into the available room choices, guiding them quickly through the process of finding a suitable room and considering other options for breakouts and registration as well as notifying interest.